A short metro ride from the centre of Stockholm, set within a hundred hectares of heavily-planted pine forest and grassy slopes lies the beautifully peaceful Woodland Cemetery. Built on the site of a former quarry, its monumental landscape provides a perfect place for quiet contemplation. In 1915 Erik Gunnar Asplund (1885-1940) and Sigurd Lewerentz (1885-1975) won joint first prize in the public competition to design a cemetery for Stockholm. For Asplund, who was the main designer of the buildings, this was to be a life-long assignment that punctuated his commissions elsewhere; his work on the scheme only ended with his death 25 years later. Lewerentz’s involvement with the scheme was to end earlier, once he had built the imposing Resurrection Chapel (1921-5). E.G. Asplund is still considered by many to be the most important twentieth-century Swedish architect, forming a bridge between classicism and modernism. He is celebrated for prominent public buildings such as Stockholm City Library (1920-28), Goteborg Town Hall (1934-7) and a number of burial grounds including the Kviberg Cemetery at Goteborg (1928). A visit to the Woodland Cemetery is a carefully delineated journey through a landscape that Colin St John Wilson has called ‘tragic and sublime’. 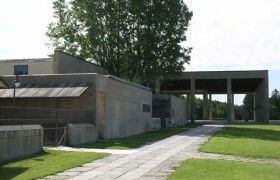 Visitors are embraced by funnel-shaped entrance walls and progress up an incline towards the loggia of the Crematorium. Straight ahead is a grassy mound topped with the birch forest known as ‘the grove of remembrance’. These apparently natural forms in fact took many years to prepare and are a central part of the architectural work of the Cemetery. A subtle romantic naturalism is key to the impact of the place: the mingling of forest and woodland, buildings and graves. 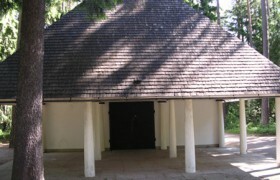 The small Woodland Chapel (1918-20) was the first of the Cemetery buildings designed by Asplund. Positioned at the end of a woodland path which leads straight into its pillared portico, with pines and spruces rising closely around it to twice its height, Asplund always intended that this building would remain ‘modestly subordinate’ to its natural surroundings. The building’s classicism is paired with a Swedish vernacular that emphasises its roots in a traditional local culture. 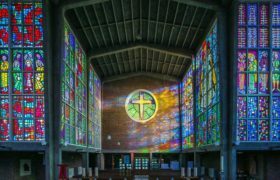 Inside, the building has a domed glass roof that sheds light on the area around the catafalque (the final resting point of the coffin) and makes the space unexpectedly bright and airy. Furnishings inside the chapel include candle-holders, a tray carrying earth to sprinkle over the coffin and chairs of oil-painted birch with plaited seats, all designed by Asplund. Key escutcheons on the Chapel’s gates are delicately cast skulls and ‘The Angel of Death’, a work by the prominent Swedish sculptor Carl Milles (1875-1955), adorns the roof. 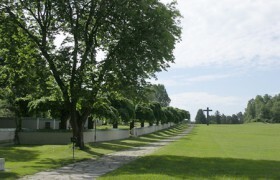 The Woodland Crematorium and its three chapels of Faith, Hope and the Holy Cross were built later, from 1935-40. These are arguably Asplund’s greatest buildings and were the last assignment before his sudden death in 1940. 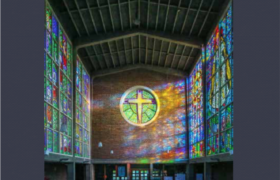 Asplund paid particular attention to furnishings for each building in order to give appropriate expression to the reflection and devotion of mourners and to ensure that there was no distraction, in his words, from ‘their essential meaning…the difficult moment of parting’. Each chapel had an antechamber in which the next-of-kin could sit on curved birch-root wood benches, each with a courtyard garden in its centre that intensified the light and serenity of the space and enabled three simultaneous services to be held while maintaining the privacy of each. Chapel furniture was designed to be plain but comfortable and the limestone floors under the family pews were carved to resemble small kilims. The materials chosen in each chapel were of the highest quality but gave the impression of simplicity: in the Chapel of Faith, for example, the hymn number boards were covered in suede and a pony-skin kneeler was placed below an onyx cross on the small hand-carved stone altar. 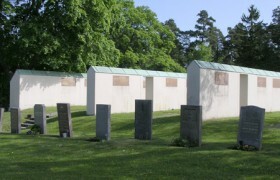 It was a cruel irony that the first funeral to take place at the crematorium was Asplund’s own. It was also the only time that the magnificent mechanical screen wall which runs the length of the back of the crematorium has been lowered to remove the division between the interior and the woodland beyond. Asplund was buried beside the Chapel of Faith under a simple stone plaque bearing the epitaph ‘His work lives’. In 1994 the Woodland Cemetery became one of the few works of twentieth-century architecture to be placed on UNESCO’s World Heritage List. To visit the Woodland Cemetery (or Skogskyrkogarden), take the Stockholm metro in the direction of Farsta strand, alighting at Skogskyrkogarden. For further information about visiting the Cemetery telephone 08-508 301 00 or email kyrkogardsforvaltningen(at)kyf.stockholm.se.